Thanks for subscribing to the ASK ANDY Production Newsletter. Here in Santa Fe, NM its April and the ski season is mostly done. In a couple weeks we will be transitioning to mountain biking and hiking. You might know Bobby from his very popular book “The Mixing Engineer’s Handbook” now in its 3rd edition. It is a great reference. He has plenty of other publications as well. Today’s post was about 6 trouble zones for EQ (or maybe you could call them “opportunity zones” because they can make you mix sound a lot better with correct attention). Click on the Thumbnail to see it larger. 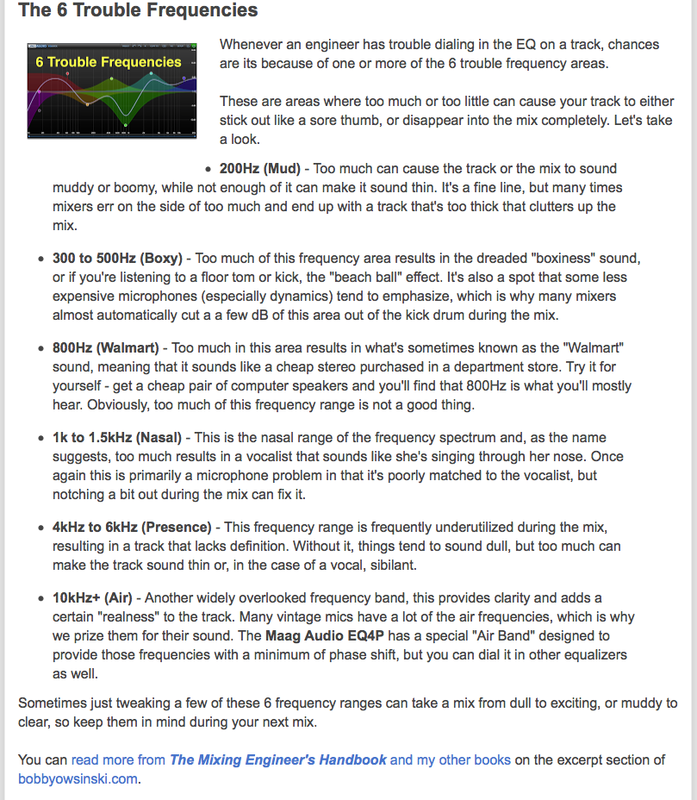 When you are referencing your Work In Progress (WIP) against some commercially available reference tracks, it helps to pay attention to how much of these various EQ zones are popping through in your mix versus your references. 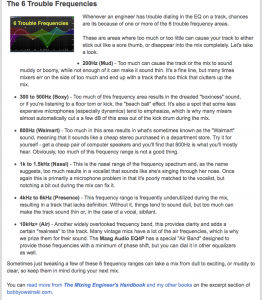 If you work enough with your eq, you will start to recognize these areas just by hearing. It really speeds up making your finished mix. NOTE: These zones exist in mix, as well as individual recordings / tracks in a session. Have a listen from this standpoint next time you are working with your music. Are you interested in more helpful hints and tutorials on Music Production and Logic and Pro Tools? Sign up for the Ask-Andy mailing list: http://eepurl.com/WRML5 and feel free to forward this to somebody you think would enjoy it. Please feel free to leave a comment about these production hints and if it was useful to you – and let me know what you have found helpful.